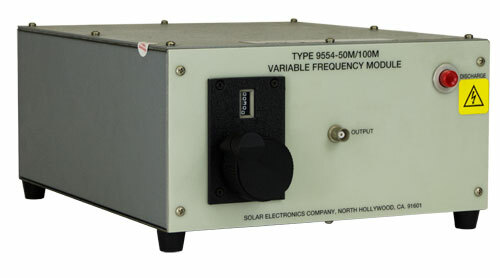 Utilizing the high voltage power source in the Solar Model 9354-1 or Solar Model 9354-2 Transient Generator, five individual modules can be connected to provide tuning of damped sinusoidal waves from 10 kHz to 100 MHz. Two cables connect the module to the Model 9354-1 or Model 9354-2. One cable is a single insulated wire to carry high voltage DC to the module. The other cable delivers low voltage DC to the module for operation of relays. The frequency of the damped sinusoidal wave is adjusted by a tuning control on the panel of the module. A graph showing frequency versus turns count on the tuning control is supplied. With the selected module connected, the charge voltage of the module is adjusted by the AMPLITUDE control on the Model 9354-1 or Model 9354-2 Transient Generator. The AMPLITUDE knob is marked in percentage of the available charge voltage for the module being used. The amplitude and frequency of the damped sinusoidal wave into the load can be determined by an associated oscilloscope with a 50 Ω input. After the charge voltage is adjusted to the desired value, the damped sinusoidal wave is applied to the load by pushing the button on the module. 50 Ω coaxial 1 W average power. Typical input VSWR in a 50 Ω system under 1.5 from DC to 1 GHz.